You are here:Home » Blog » Byron Bay Holiday Guide » Get in before the Christmas rush!!! Get in before the Christmas rush!!! As we all know Christmas is just around the corner and it is a very busy time. 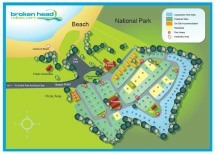 Here at Broken Head Holiday Park if you beat the Christmas rush, you not only pay off-peak rates but also you have the park and our secluded beach all to yourself. With great weather and awesome surf why wouldn’t you want to stay? Just call our friendly team on our toll free number 1800-450-036 and ask about our great week and weekend packages that don’t break the budget. “Like” us on Facebook. For all of the latest news, hot deals and fan only specials!